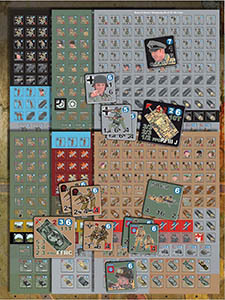 The award-winning, squad-level Lock ’n Load Tactical Series jumps into Western Europe in 1944 with Heroes of Normandy. 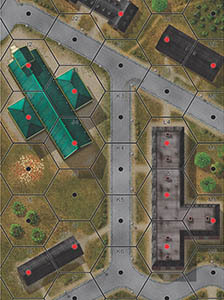 From the initial D-Day drops, on June 6th, to the fighting in the Norman bocage, and on to Operation Market Garden, this combination of Band of Heroes and its expansion, Swift & Bold, arrives at the battle heavy, with 30 scenarios, over 650 die-cut counters, and the latest v4.1 rules. Command audacious American and British paratroopers and glider troops in daring missions against stalwart defensive positions and fiendish counterattacks by the German Wehrmacht, SS and Fallschirmjägers. Heroes of Normandy has 30 scenarios and tells the battles of the men from the 101st Airborne, 82nd Airborne, British 6th Airborne, 17th SS Panzergrenadier, 6th Fallschirmjager, 91st Airlanding and 352nd Infantry Divisions. The scenarios cover battles spanning the D-Day drops, fighting the Norman hedgerows and Operation Market Garden. •	6 Counter Sheets with over 670+ counters. •	1 Full Color Core system manual featuring the latest v4.1 rules.